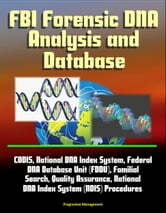 This essential guide to FBI forensic DNA analysis and database management reproduces important guides and manuals, including the National DNA Index System (NDIS) Operational Procedures Manual, FBI Quality Assurance Standards Audit for Forensic DNA Testing Laboratories and Federal DNA Database Unit DNA Buccal Collection Kit Training and Procedures. There is comprehensive information about the CODIS program. CODIS is the acronym for the “Combined DNA Index System” and is the generic term used to describe the FBI’s program of support for criminal justice DNA databases as well as the software used to run these databases. The National DNA Index System or NDIS is considered one part of CODIS, the national level, containing the DNA profiles contributed by federal, state, and local participating forensic laboratories. For example, in the case of a sexual assault where an evidence kit is collected from the victim, a DNA profile of the suspected perpetrator is developed from the swabs in the kit. The forensic unknown profile attributed to the suspected perpetrator is searched against their state database of convicted offender and arrestee profiles (contained within the Convicted Offender and Arrestee Indices, if that state is authorized to collect and database DNA samples from arrestees). If there is a candidate match in the Convicted Offender or Arrestee Index, the laboratory will go through procedures to confirm the match and, if confirmed, will obtain the identity of the suspected perpetrator. The DNA profile from the evidence is also searched against the state’s database of crime scene DNA profiles called the Forensic Index. If there is a candidate match in the Forensic Index, the laboratory goes through the confirmation procedures and, if confirmed, the match will have linked two or more crimes together. The law enforcement agencies involved in these cases are then able to share the information obtained on each of the cases and possibly develop additional leads. CODIS was designed to compare a target DNA record against the DNA records contained in the database. Once a match is identified by the CODIS software, the laboratories involved in the match exchange information to verify the match and establish coordination between their two agencies. The match of the forensic DNA record against the DNA record in the database may be used to establish probable cause to obtain an evidentiary DNA sample from the suspect. The law enforcement agency can use this documentation to obtain a court order authorizing the collection of a known biological reference sample from the offender. The casework laboratory can then perform a DNA analysis on the known biological sample so that this analysis can be presented as evidence in court.